When an accident happens, teeth can be broken or completely knocked out of the socket. The risk of permanent damage to teeth can be reduced by wearing a mouth-guard for certain sports. Find the tooth and hold it by the smooth white part that's usually visible in the mouth (the crown). Avoid holding it by the root. Don't scrub or rinse the tooth in anything except water or milk. If the tooth is clean, hold it by the crown, and making sure it's the right way round, gently push it into its socket. If it's dirty rinse it in milk, or rinse for a second or two in cold water, then gently push it back into its socket. Hold the tooth in place by biting on a piece of cloth and go to a dentist immediately. go to a dentist immediately. Please remember this advice is only for managing knocked-out permanent teeth. If a baby tooth is knocked out, don't try to put it back in its socket, as this may damage your permanent teeth. Always seek advice and treatment from a dentist. ACC covers most or all of the cost of many accidental or sporting dental injuries for people of all ages. 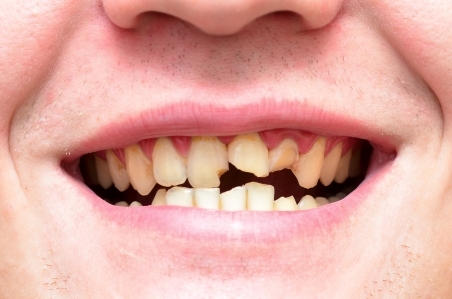 Find out more about saving a knocked out or damaged tooth.